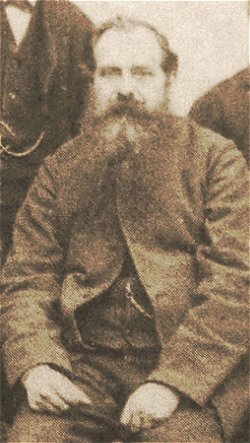 Robert Henry Higham was born about 1841 in Constantine, Cornwall, the son of shoemaker Robert Charles Higham (1806-1870) and his wife Elizabeth née Rickard (1809-1890). In the 1841 census Robert was living at home with his parents and four younger siblings at Crowan, Cornwall. The 1851 census listed 20-year-old Robert Jnr as a shoemaker, working alongside his father and younger brother Thomas. The family were still living at Crowan, the only difference being that Robert now had seven younger siblings. In the spring of 1853 Robert married Sarah Vivian Goldsworthy of Camborne at Redruth, Cornwall. After their marriage Robert and Sarah moved around quite a bit since by the time of the 1861 census they had three children; the eldest daughter Bessie was born in 1853 at Crowan, daughter Ellen was born in 1856 at Falmouth and their son Robert was born in 1858 at Coleridge, Devon. The 1861 census however found the family living at Redberth, Pembrokeshire, Wales, where Robert gave his occupation as National Schoolmaster. Sarah died in 1867 and in 1870, at the age of 40, Robert married Louisa Wright, aged 20, at Reading, Berkshire. In the 1871 census Robert and Louisa were living at the schoolhouse, Snatchwood Road, Trevethin, Monmouthshire with Robert's six children from his first marriage. He again gave his occupation as National School Master. On 14 October 1875 Robert was appointed headmaster of Reckleford Board School, Yeovil, at a salary of "£170 for the first year, not including gas and coal." 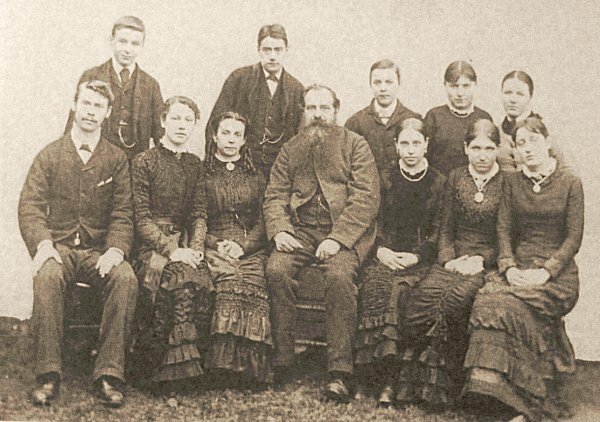 The photograph below, taken in September 1880, shows Robert, with a very healthy beard, seated with his wife Louisa, also a teacher, and the rest of the Reckleford School staff. In 1876 the Yeovil School Board fixed school fees at 2d a week per child (two old pence in 1876 is worth about £1 at today's value) at the infants school and 3d a child attending the other schools. Frequently fees were remitted in cases of hardship. In 1885 Robert Higham recorded in the Reckleford School logbook "Stanley Dobson today received such a caning as is not often given in this school for spending a penny of his school money every week for about 12 months. Mrs Dobson had always given Stanley 3d a week to pay for his fee which is only 2d and today she arrived at school to complain of being overcharged." He added the note that Mrs Dobson had also promised to give Stanley a "damn good hiding when he got home." A perpetual problem of this period in all schools was absenteeism, since many parents remained unconvinced of the value of education and frequently gave it second place to household chores, and so forth. In October 1876 Robert recorded that several parents had requested their children be absented from school since they needed help in "getting up the potatoes." The next year almost half the school were absent following a 'great storm' in order to collect wood scattered by the storm. The 1881 census listed Robert and Louisa, together with his son Vivian, living at Reckleford Board School. Robert gave his occupation as 'Certified Teacher & Certified Teacher of Natural Sciences', Louisa listed her occupation as 'Certified Teacher' while 16-year-old Vivian listed his occupation as 'Articled Pupil Teacher'. At the occasion of the census Robert's son Robert Jnr, also listed as a Certified Teacher, was visiting. It was in 1891 that Robert Higham dismissed a teacher called Hemmings for inefficiency. In turn Hemmings accused Higham of manipulating the school registers in order to earn a larger Government Grant and hence his increase own salary. A full enquiry was held by the School Board which resulted in a reduction of £23 12s in the Grant due to poorly kept registers and Higham was forced to make up the difference from his own salary. In his defence he admitted that he had spent too much time on 'higher subjects', leaving the registers to his assistants and although the Board believed that blame should not be attached to him, he resigned within the year. In the 1891 census Robert and Louisa were listed living in Woking, Surrey, with their nine-year-old son Ernest, Louisa's sister Martha and her son also called Ernest. Robert listed his occupation as 'Certified Teacher in charge of Board School'. Louisa died in the 1890s and Robert was listed in the 1901 census as a 68-year-old widower living at Aldrington, Sussex. By now retired he listed his occupation as 'Certified Teacher Superannuated'. Living with him was his 19-year-old son Ernest, an articled schoolteacher, and a domestic servant. Robert Higham died 21 October 1906 at Thornton Heath, Surrey. His effects totalled £2470 14s 9d (in excess of £850,000 at today's value). The staff of Reckleford School photographed in September 1880. At centre are the headmaster, Robert Higham, and his wife, Louisa (on his right) who was Headmistress of the Infants School. It is likely that one of the young men is his 15-year old son Vivian who, in the census of the following year, was listed as an 'Articled Pupil Teacher'. 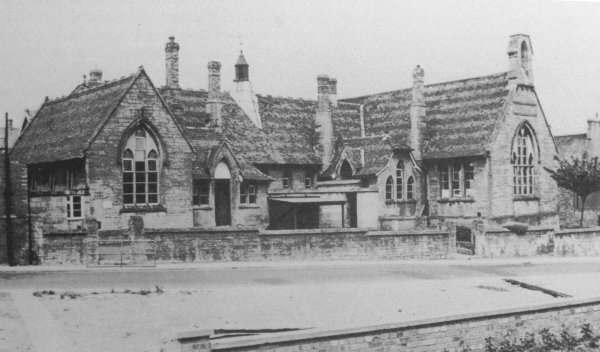 A photograph of Reckleford Board School possibly taken around the time Robert Higham was its headmaster.